A sea of business suit-clad men were walking on the busy sidewalk during rush hour on a New York City street. Amidst the hustle and bustle of the serious business world emerges a father holding the hand of his son. Bright reds, greens, blues, and the Signature “S” on the back of a cape stands out in the sea of black and brown. He had a spring in his step and yet held tightly to the hand of his Dad. “Super-Man!” unleashed in our midst. Innocence mixed with courage mixed with color and a tenacity to stand out in the crowd…that’s a picture of what is vibrant in my eyes. The supermen of the world were once super-boys with the zest for life to dream of being superman in their own worlds. 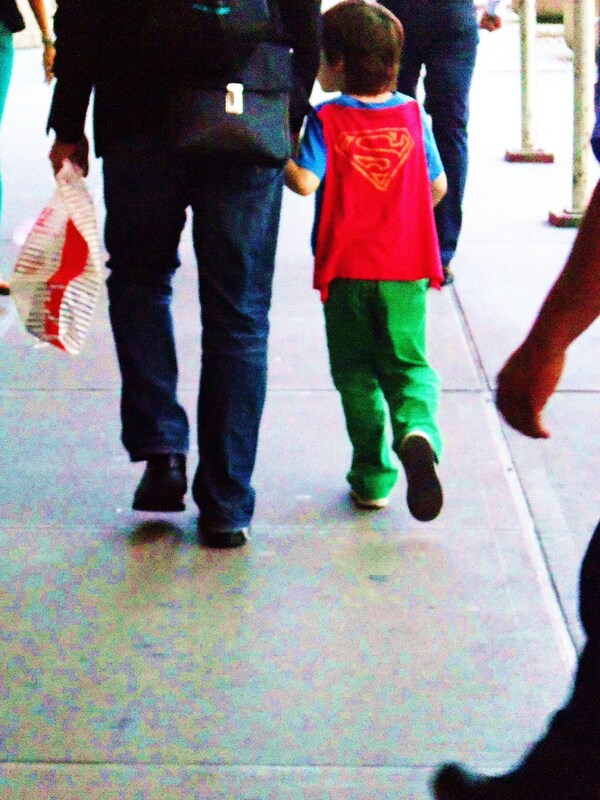 I so applaud the father of this little boy who let this young son wear his cape in his own little corner of the world! Let him dream of saving the world and flying and conquering evil villains. We were made to live, dream, and be courageous…and to encourage those in our lives to do the same.